This serger/overlocker offers great sewing comfort. It cuts, sews, and finishes in one single step. The L 460 produces seams and hems of the highest stitch quality, from fine rolled hems to wide decorative edges. 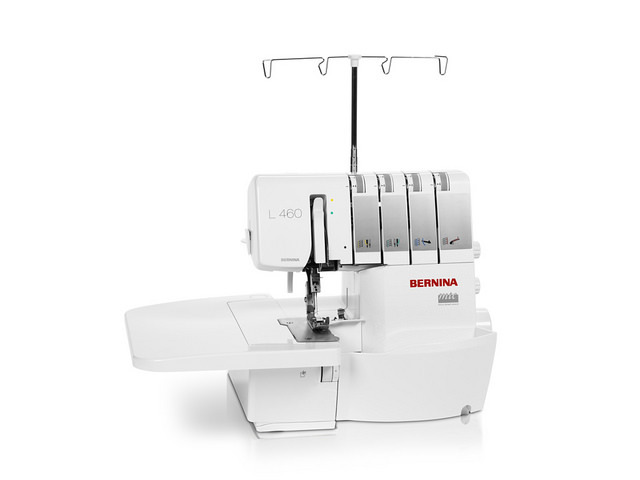 The L460 features the BERNINA Free Hand System that allows both hands to be free for sewing and placing the fabric while raising and lowering the presser foot with the Free Hand System. The BERNINA foot control and DC Motor allows stitch by stitch sewing and top seeps of up to 1500 stitches per minute. Working with an overlocker means saving time and stitching fast. Sewing projects take shape quickly and with little effort. Innovative features make BERNINA overlockers delightfully easy to use, ensuring professional quality down to the very last stitch. The overlocker is the perfect companion to a sewing machine. 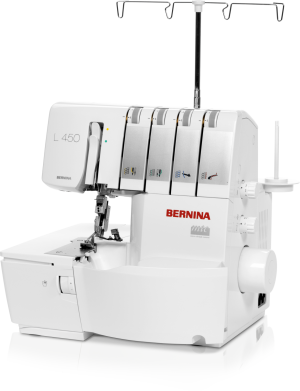 The BERNINA L450 offers High-quality stitches, wave-free seams, fast and smooth at any speed, easy and ergonomic threading with the color-coded threading path and a well-lit, large sewing space. The BERNINA L 450 also offers the following benefits: Sews, cuts and finishes seams in one operation for efficiency and with precision, easy and comfortable to handle even for beginners 2-3-4 thread stitch formations provide the most flexibility in selecting the perfect stitch, professional stitch quality each time, excellent rolled hemming, perfect for stretchy and woven fabrics, and ruffles and gathers automatically with differential feed.